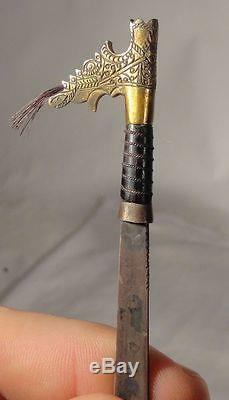 Antique vintage sterling silver copper inlaid and brass handled miniature headhunters sword from borneo, probably used as a letter opener. Some items we offer have age and wear, this wear due to age may include breaks, repairs, repainting, or restoration, we try to call this damage as well as possible but please refer to the photography for a full description. HEIGHT 7 3/4 inches 19.8 cm. WIDTH 7/8 inches 2.3 cm. We do not guarantee the age of any piece we sell, we are not experts on age and can only describe the items to the best of our ability. This fine antique is offered with a fair and reasonable fixed price, I trust my descriptions and photos detail this item to justify the asking price. If you do need information I have neglected to include, make an offer, or additional photos, please don't hesitate to ask, I will do my best to comply. 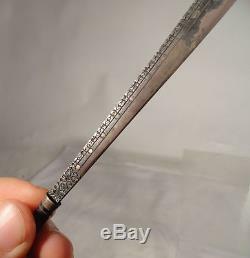 The item "Antique South East Asian Borneo Headhunters Knife Silver Letter Opener Miniature" is in sale since Wednesday, October 12, 2016. This item is in the category "Antiques\Asian Antiques\Southeast Asia\Other Southeast Asian Antiques". The seller is "theoldcanaanmarket" and is located in Canaan, Connecticut. This item can be shipped worldwide.